WELDON, N.C. – On Friday, March 2, seven members of the Phi Theta Kappa (PTK) Honors Society at Halifax Community College (HCC) celebrated Dr. Seuss’s birthday in style! The PTK students, along with the advisors and volunteers, spent the morning reading Dr. Seuss books to the children at the HCC Childcare Center. With familiar titles such as Hop on Pop, Green Eggs and Ham, and Great Day for Up, the children were engaged in the stories in each of their reading groups. "We wanted the chance to give back to our childcare center," said Gary Redding, co-advisor of PTK. "We want them to love to read and what better stories to read than Dr. Seuss." 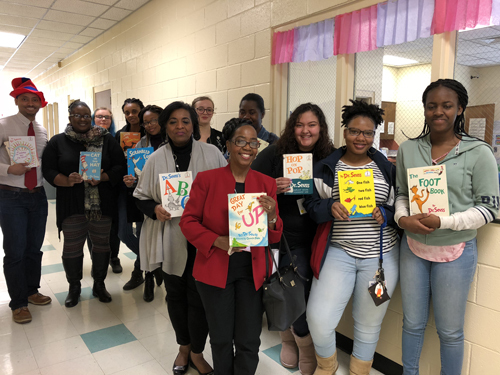 The members who volunteered to read to the children were Jada Anderton, Ulyssia Banks, Tayla Behrends, Charisma Daniel, LaShauna Joyner, Lacara Ramsey and Sophia Wright. The staff and faculty volunteers were Redding, Dr. Rachel Stephens, co-advisor of PTK, Sonya Robinson and Roslyn Pemberton. Dr. Seuss Day at the HCC Childcare Center. In the photo are Jada Anderton, Ulyssia Banks, Tayla Behrends, Charisma Daniel, LaShauna Joyner, Lacara Ramsey and Sophia Wright, Eunice Hill, director of the HCC Childcare Center, Gary Redding, co-advisor of PTK, Dr. Rachel Stephens, co-advisor of PTK, Sonya Robinson and Roslyn Pemberton.